7Up is the brand name for a lemon-lime flavored soda that was first created in the 1920s. Because of its long history, 7Up is used in classic as well as in modern cocktails. The sweet, lightly citrus taste pairs well with sweet and nutty flavors, and it can also combined with most basic hard liquors, such as vodka and gin. It can be used to make non-alcoholic drinks as well. The diet version tastes the same and cuts the sugar content of your drink dramatically, so it can be a more virtuous option than the regular soda. 7Up is fairly neutral in flavor, and its sweetness means it can pair well with most well drinks, which are liquors that form the base for most cocktails and are considered a bartender’s staple. 7Up pairs well with white liquors, such as gin, vodka and white rum. 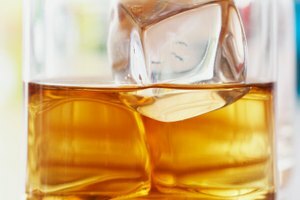 It can also mix well with whiskey and dark rum, although these pairings are less common, because the slight smokiness of whiskey and aged rum clash with the lightness of 7Up. 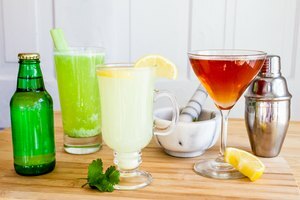 7Up can also be mixed with sweeter, nuttier drinks to make distinctive cocktails. Nut-based liquors, such as Disarrono or Amaretto, pair well with 7Up, as the citrus flavor and carbonation cut the syrupy sweetness of these liquors. Mix 2 parts 7Up to 1 part nut liquor, and pour over ice. Serve in a rocks glass for a classic look, and garnish with a maraschino cherry. Because of its flavor profile, 7Up is also often combined with other fruit flavors, such as cherry or orange juices, to make fruity cocktails. Spritzers, fizzy, fruit-flavored alcoholic drinks often use 7Up to provide the fizz and the sweetness. Mix equal parts fruit juice, such as pomegranate juice, and 7Up with 1 to 2 ounces of white spirits, such as vodka, for a classic spritzer. Pour over ice and serve in a tall glass with a slice of lime. Because 7Up is naturally sweet, sour and carbonated, it can be used as a substitute for multiple ingredients – club soda, sugar and sometimes citrus juice – in some cocktails. 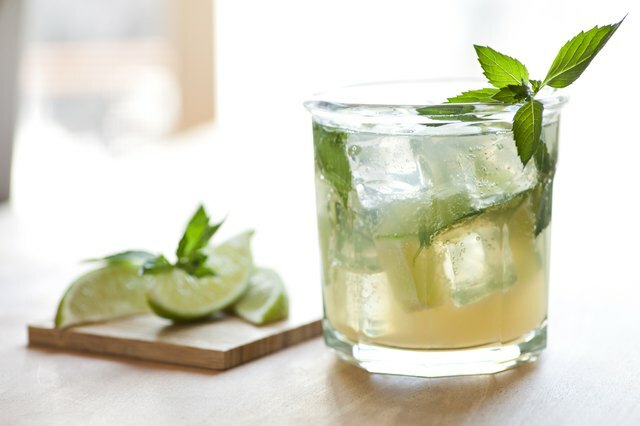 Drinks such as mojitos and gin fizzes use lime juice and simple syrup to flavor drinks and club soda to provide carbonation. For example, for a 7Up mojito, substitute the carbonated water, simple syrup and half of the lime juice with 7Up. 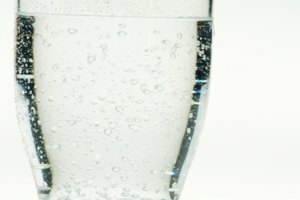 Because commercial tonic water lacks the natural bitterness of homemade tonic water, you can sometimes use 7Up as a replacement for tonic water in some drinks, such as a gin and tonic. For a closer approximation of tonic water, add a dash or two of bitters to the drink. 7Up is often used to make non-alcoholic drinks in which its sweetness and carbonation add an exciting twist to otherwise standard drinks. You can mix 7Up with fresh fruit juices as well as flavored syrups to produce a memorable carbonated drink. A classic non-alcoholic drink, the Shirley Temple, originated in 1930s Hollywood and is composed of grenadine syrup mixed with 7Up. Add 1/4 ounce of grenadine to 1 to 2 cups of 7Up, or to taste. Serve over ice and garnish with a maraschino cherry. You can also combine 7Up with flavored syrups, such as hazelnut, cherry, vanilla or cinnamon to make a variation on an Italian soda. While Italian sodas are commonly made with soda and syrup, using 7Up adds extra sweetness and a touch of tartness to the drink. Mr. Boston: Official Bartender's Guide; Anthony Giglio and Jim Meehan, eds. Rachel has worked professionally as a chef and writer on food since 2010. In addition to a Bachelor of Arts degree, she holds a diploma in classic culinary arts from the French Culinary Institute. She has an active interest in wine, fine dining and sustainable agriculture. 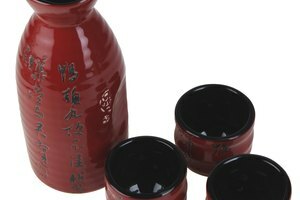 What Can You Mix Sake With?